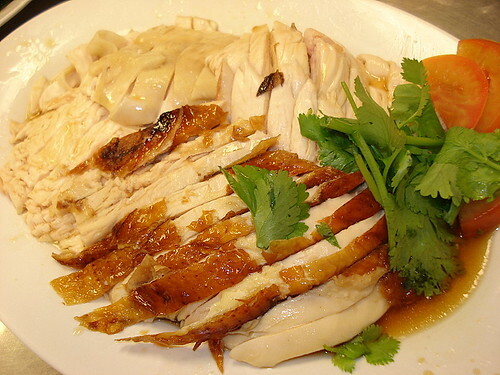 Roast and steamed chicken, originally uploaded by Camemberu. Today is Singapore's National Day and what better dish to celebrate with than chicken rice, often hailed as the national favourite of this little island. Hubby brought me to Sin Swee Kee at Seah Street - a simple but cheery little joint that serves delicious chicken rice. This is a half-chicken portion of mixed roast and steamed chicken - delightfully tender with no gamey smell (we didn't try the kampong chicken option though). The sauce drizzled on the chicken is the most intensely flavoured I've come across. A little heavy on the light soy sauce, but very savoury and fragrant! Rice was good - nice, firm, flavourful, and not clumpy. 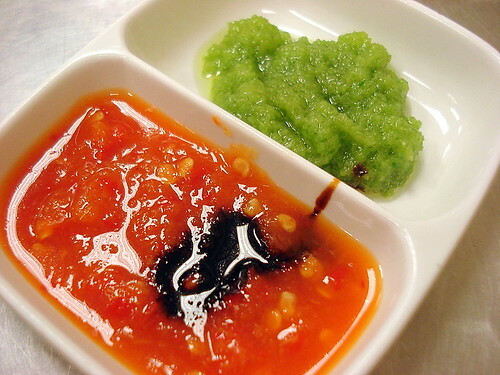 Chili sauce with sweet black sauce and golly - minced green-coloured ginger!, originally uploaded by Camemberu. Interestingly, they serve a bright green minced ginger as part of their condiments (one reader kindly informed me that the colour is due to spring onions added to the ginger). The chili, which is very important, is good too, as is the thick black premium soy sauce. All three mix well to give extra oomph to the chicken and rice. 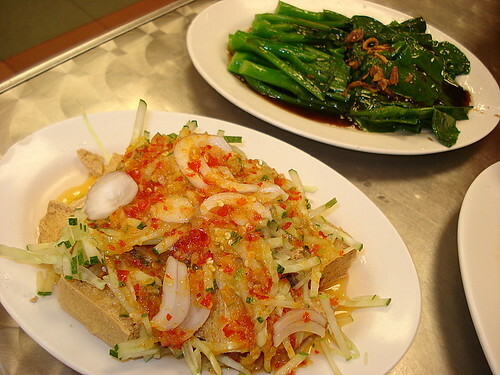 Thai-style tofu and Hong Kong style kai-lan, originally uploaded by Camemberu. Quite a few other side dishes here to choose from too. You got your tofu and your vegetables. All competently done. 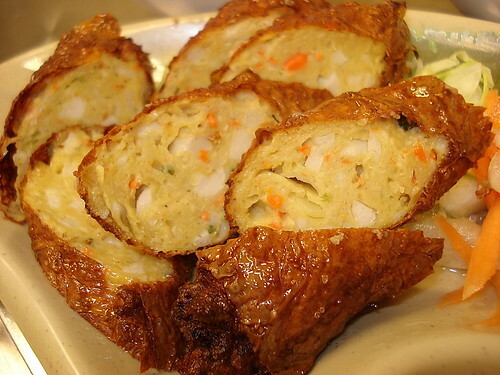 The tofu is very soft and tender while crispy on the outside. Tangy toppings. All very intensely flavoured too. Crispy hot ngoh hiang, originally uploaded by Camemberu. There's also fried ngoh hiang (S$2), which is best eaten when piping hot (while the skin is still crispy). Comes with a sweetish (plum?) sauce and some achar (local pickles). Sin Swee Kee is at Seah Street, originally uploaded by Camemberu. I'm not sure if this Sin Swee Kee (or New Swee Kee?) is related to Swee Kee chicken rice. In fact, what is it with chicken rice restaurants and the name "Kee"? Witness Sin Kee, Swee Kee, Eng Kee, Peng Kee, Loy Kee, Long Kee, Ming Kee, Nam Kee, Wee Nam Kee, Boon Tong Kee...see? I've not tried all of them but Sin Swee Kee has just moved to the Top 3 charts for me in terms of chicken rice. Tasty fare priced very reasonably (only S$21 for all those dishes above plus drinks). They have a single person set menu for $5+ and a two-person set with sides for $15+. We just went overboard with the a la carte. Very happy with this place. Oh, sorry, I didn't mean green as in young ginger, I meant green-coloured ginger! But thanks for the info - I didn't know it was due to spring onions. I'll put it into the blog itself! TO ALL CHICKEN RICE LOVERS, PLS TRY CHYE KEE HAINANESE CHICKEN RICE!! !